In spite of speculation in Wall Street and the rise in assets prices, In 1927 the FED implemented tighter monetary policy. The rise in rates didn't let to less speculation in Wall Street but did have an impact in foreign debtors. Also, because of the Gold Standard, there was an inflow of capital from foreign countries, that led to more money into Wall Street. 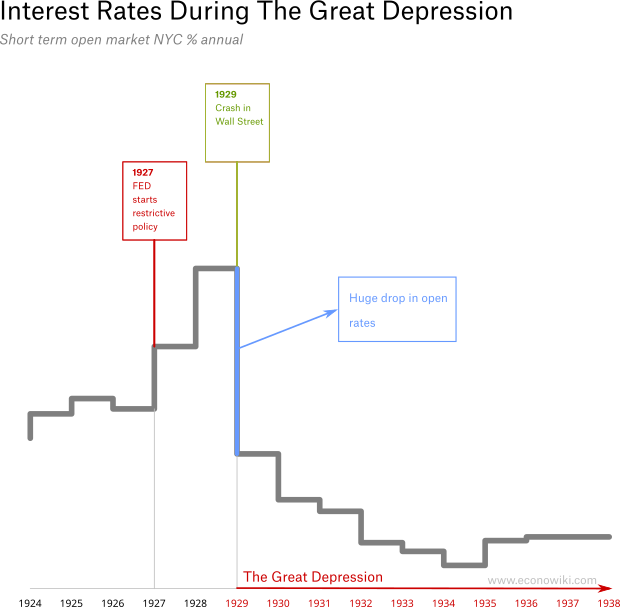 The system became more unstable after the rise of the rates. The above chart shows the open market rate in NYC. This is not the discount rate of the FED. In 1929, the FED implemented a tighter monetary policy. In fact, the monetary base reduced during 1929. So, why did the interest rate fall after there was a smaller monetary base? Doesn't common analysis lead to the opposite effect? The economy fell so sharply that the open market interest rates fell abruptly. The policy of the FED after 1929 was again one additional cause of duration and impact of The Great Depression. During the onset of the Great Depression, many economists believed that banks in trouble should fall. The system would become more solid and the good banks would survive. Time proved that view wrong.